Please click the image above and complete this survey. Please see below or in downloads for previous feedback published and check out other published information about the Local Offer. We are continually adding records, links and features such as embedded videos to the local offer. Our intention is to make this facility as useful as possible for Torbay families, enabling them to find the SEND information they require. Please do continue to provide feedback to enable us to grow the local offer and make sure it reflects the needs of local people. If a service or organisation is missing or is difficult to find ? If any information is inaccurate or our out of date ? If you have suggestions for how the local offer could be improved ? We would also like to hear from you if you feel that there is a lack of a specific type of service, organisation or support in Torbay. We can’t promise that every suggestion will be put in place, but each will be considered and published here (all suggestions will remain anonymous). 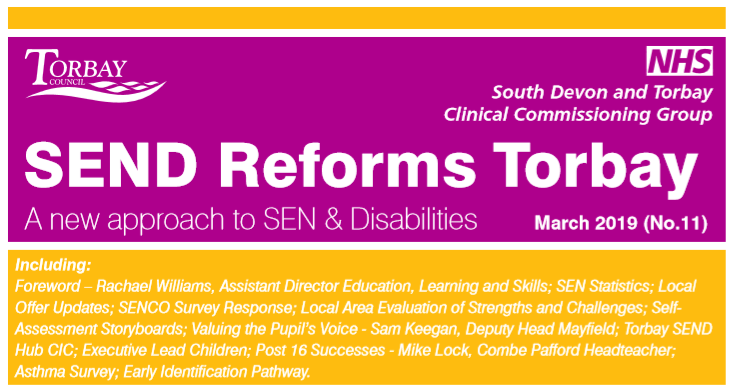 Read the most recent SEND Reforms Newsletter or visit the SEND Reforms Update Local Authority Webpage to view all previous newsletters and other related information. The number of RSAs received continues to climb. The table below shows an annual comparison since 2014. The results from this DfE comissionednational survey ranked Torbay as the 6th best Local Authority in relation to parents and young people’s satisfaction with the EHC process, and the 15th best Local Authority in relation to parents and young people’s confidence that having an EHC plan will help them meet expected outcomes. Primary, secondary and special schools SENCos were sent a link to a survey in June 18 with the aim of driving service developments. The survey was responded to by 23 SENCos, the results are contained within the document. To read the full feedback, please either click on the image below or on the document title in the downloadable documents section on the right hand side of this webpage. Please click on the image below to see results from the 2017 Clinical Comissionoiing Group (CCG) consultation in relation to changes to services and reprocurement in line with the Wider Devon Sustainability and Transformation Plan (STP) which covers services accross Torbay, Devon & Plymouth. Children & Family Health Devon from Torbay and South Devon NHS on Vimeo.